The portentous weather of a passing storm delayed our departure from El Nido in northern Palawan, the pencil-thin Philippine province repeatedly lauded by glossy travel magazines as the #1 best island in the world. The clouds finally surrendered to the midday sun, spotlighting a scenery that I thought only belonged to the realm of dream sequences or desktop wallpapers. A deserted islet lay before us, fringed with coconut trees sprouting from talcum-white sand and embraced by water that glimmered in the most inviting shades of aquamarine. I victoriously cannonballed from the prow into the warm sea, and discovered that the underwater views were equally breathtaking. No other boats or villages were in sight. I victoriously cannonballed from the prow into the warm sea, and discovered that the underwater views were equally breathtaking. Above a pristine bed of antler-like coral, we were dolphin-kicking off the islands of Linapacan in tropical waters that have been acclaimed to be one of the world’s clearest. A stingray fluttered away on the seabed, as my shipmates circled large domes of coral populated by a rainbow of reef fish. Finally, a hawksbill turtle surprised us along the drop-off, sending us off with a gentle wave of its flippers. Chilling onboard the Balatik, as we sail from El Nido to Coron over five days! Plunge into the coral gardens of Linapacan – once heralded to have the world’s clearest waters! Our boat captain Gener signals by blowing into a helmet shell. We visited remotest beaches of El Nido, Linapacan, Culion and Busuanga. The trumpeting of a helmet shell beckoned us back to the boat anchored offshore. And I am reminded that the very vessel that ferried us to this uncharted paradise was itself a beauty to behold. 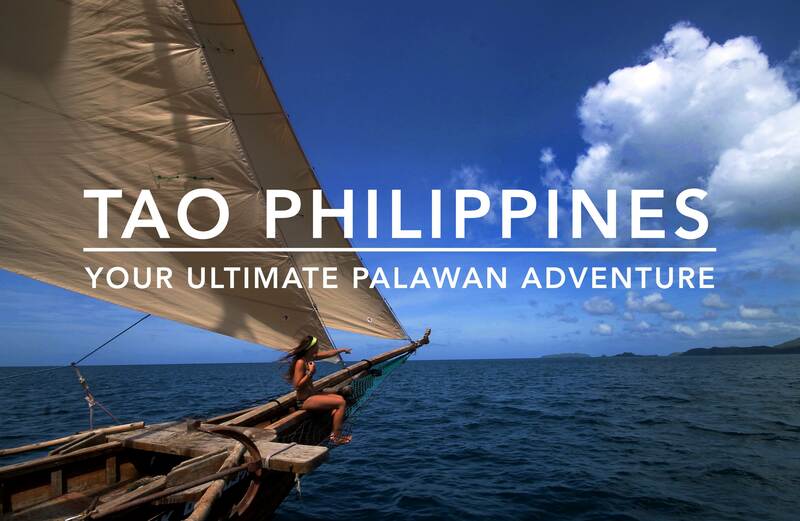 I was on a five-day, four-night expedition from El Nido to Coron aboard the Balátik, a handsome 72-foot paraw or traditional wooden sailboat powered by both wind and engine. The vessel takes its name from the Visayan word for Orion, an important constellation used by Filipino sailors in maritime navigation since precolonial times. The largest of its kind in the archipelago, it’s the newest addition to Tao Philippines (pronounced ta-o), a pioneering company that has been taking adventurers for the past decade on freewheeling expeditions across a labyrinth of more than 200 islands in northern Palawan, a playground of limestone karst, fine beaches, jungle-clad islands, technicolor reefs and WW-II shipwrecks. The waters of Nacpan Beach, El Nido are impossible to resist! The 72-foot Balatik is modeled after the Filipino paraw or wooden sailboat. We had to swim or kayak from the boat to our campsites! I loved getting up early to watch the sunrise, like this one on Ginto Island, Linapacan. Making necklaces onboard with the Tao Philippines crew. There were ten other guests on the boat, which can comfortably accommodate more than twice as much people. First, there was Alexandra, Audrey and Brandon — a bronzed trio of American misfits straight out of an episode of Survivor — who were either sun-worshipping on the deck, cracking jokes, or learning Tagalog while making seashell necklaces with the crew. The fourth American was Craig, a giddy marketer from New York who loved sailing as much as Sander, the mild-mannered Dutchman. Meanwhile, Vidur was the worldly Indian businessman who spent most of the time fishing at the stern. Two international couples were on board: Bertrand and Olga were the French-Russian sweethearts, whereas the Portuguese-Canadian tandem, Wilson and Andrée, acted more like best friends than a canoodling twosome. Our motley group got along pretty well, especially when we played beach volleyball, or huddled around the dinner table to feast on the freshest seafood and organic veggies prepared in the on-board kitchen. After a day of lounging on deck with the salty breeze on our sun-kissed faces, our nights were spent in simple beach camps illuminated by flickering oil lamps beneath starry skies. Assisted by a crew of seven, our sailing expedition was led by Gener, a passionate dreadlocked native of Palawan, who donned a sarong and wielded a kris, looking like a cross between Jack Sparrow and 16th century Filipino war hero Lapu-Lapu. “This is my dream,” he confessed with a glint of pride in his eyes, after hoisting the sails when the wind picked up, as the Balátik followed the desolate western coast of Culion island. “The pirate’s life’s for me!” Alexandra chimed in. If such was the life of an outlaw, it would be hard to disagree. After a day of lounging on deck with the salty breeze on our sun-kissed faces, our nights were spent in simple beach camps illuminated by flickering oil lamps beneath starry skies. Our mornings thereafter began with sunrises as golden as the rum-pineapple sundowners that capped off the evenings before, heralding another day of unhurried cruising in search of the next pristine beach or gin-clear snorkeling spot. Without a doubt, Tao has elevated island-hopping to a venerable art form. Enjoying breakfast at our final campsite on Depelengued Island, Busuanga. Snorkeling at a WW-II gunboat off Lusong Island, Coron. Tao expeditions fund social welfare projects like this organic farm in El Nido. But more than just being a tour operator, Tao is also a social enterprise that aims to nurture a sustainable balance between local communities and the natural environment. The expeditions help fund social welfare projects centered on education, nutrition and medical assistance in several villages. At the 20-hectare Tao Farm in El Nido — the largest of their 16 eco-friendly base camps — local youth are taught boatbuilding, sailing and organic farming, introducing environmentally sound alternatives to destructive methods like kaingin (slash-and-burn farming) and dynamite fishing practiced in Palawan and elsewhere in the country. Indeed, it is people that make these trips truly rewarding. The company, after all, takes its name from the Filipino word for “human” or “person”. Beyond exploring some of the world’s most beautiful islands, these awesome journeys are all about tao – the people behind it, the people you travel with and the people you help along the way. Our boat captain Gener with his awesome crew! 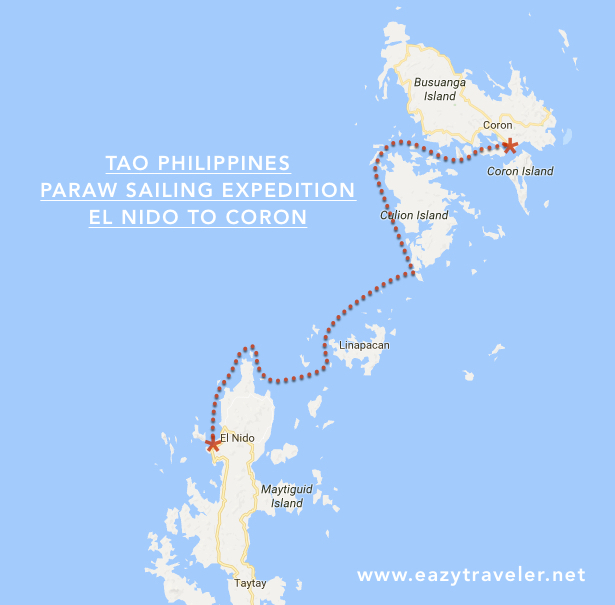 Tao Philippines’ paraw trips run between Coron and El Nido during the amihan (northeast wind) season from October to June. 5D/4N full board expeditions are PHP 28,500 (USD 564) per person, inclusive of a charitable donation. Book at least two months in advance, since slots are limited. For more information, visit Tao Philippines. Book your accommodations as well ahead of time for a hassle-free departure and arrival. Find discounted rooms in Palawan here. Baggages are transported by kayak between the boat and campsites, so keep your clothes and gadgets safe and dry by storing them in a 30-liter dry bag. Don’t forget to bring your power bank and extra camera batteries. There will be a limited supply of electricity during the expedition. Bring your own fins for snorkeling, as only masks and snorkels are provided. I still couldn’t believe I was able to experience this while on assignment! I’ve tried Tao December of 2015! I missed the Balatik, Capt Gener, Amo (the pirate Dog) and Palawan ofcourse. superb experience! My husband and I are planning to go to Coron, Palawan with our two kids. They haven’t been there and whenever they saw photos of Coron in the Internet, they can’t stop asking us about it. I’ve been searching for a kid-friendly tour package and the only one i saw was from Ultimate Coron Experience (ultimatecoronexperience.com). Now, I’m just planning when are we going to visit Coron and we want to experience Paraw sailing too. Coron is one of the best places I’ve visited in my entire life. It’s the number one destination in my bucketlist when I visited the Philippines last year. So, a month before my flight to the Philippines, I booked a 3D2N tour package from the amazing team of Ultimate Coron Experience (ultimatecoronexperience.com). They offer the best tour package and to my surprise, the rates are really affordable.